Given the state of our economy, many suburbanites and rural homeowners are resorting to raising their own small livestock in order to slash their budgets and provide food essentials for their family. Because of this increase in suburban homes keeping livestock, many are taking a stand against HOAs to change their intolerant policies on no livestock in the neighborhood. Regardless, if prices continue to escalate on basic food necessities like eggs, meat and dairy, we will be left with no choice but to raise our own. Purchasing livestock for the first time, whether you are in suburbia or are a rural homeowner is both a nerve-wracking and an exciting adventure. I prefer to start with “trouble-free” breeds that are hearty and can, for the most part, take care of themselves. Of course, when you first start raising livestock, it can be overwhelming and dare I say nerve-wrecking to say this least. When I first started caring for my chickens and rabbits, I was afraid that I would make detrimental mistakes. But, like everything in life, there is a slight learning curve, good people to help and eventually the confidence to continue on. I recommend doing ample amounts of research. Find out about shelter sizes, how many animals would be best for providing for your family, how to care of them and what supplies you will need. I highly recommend “The Backyard Homestead: Produce all the food you need on just a quarter acre!” It’s a great primer for getting started and using the most of the space you have. It goes without saying, but finding livestock that are relatively quiet and will not disturb neighbors is ideal when living in close proximity with others. Quiet livestock choices like quail, guinea pigs and rabbits are ideal in this case. As well, many backyard homesteaders choose small breeds that are easy to care for and require minimal upkeep. Micro-livestock, such as chickens, quail, guinea pigs, ducks and rabbits are, by far, the most popular livestock breeds amongst new homesteaders simply because they are the easiest to care for and require less space, and less food. In exchange, the animals provide your family with meat, eggs and rich manure for the garden. Better feed conversion (amount of feed it takes to make one pound of animal). Small breeds are less expensive to purchase and produce much more per pound of animal. Small backyards are not an issue with small breed animals. Your livestock can also help you to prevent things from going to waste that would normally be thrown out, such as vegetable peels and scraps, leftovers, and stale bread. If you plan on butchering your livestock for food, the butchering time is minimal and the blood and bones of the animals make blood and bone meal which are excellent soil amendments. There are many homesteaders who recommend goats as a beginner livestock choice, but there are some challenges you will face and goats are not suited to live in smaller yards like those found in suburbia. As well, many neighborhoods frown upon pigs, even the smaller breeds like the American Guinea Hog because they destroy the yards. So I prefer to stick with the breeds below. Here are some ideal small breed choices and some future reading you can do to familiarize yourself with the breed before purchasing. Which Kind of Chicken Breed Is Best For Your Backyard Flock? Recently, I suggested some easy strategies to get you motivated to start a small homestead in your backyard. Hobby homesteading can easily be transitioned into sprawling suburban neighborhoods provided you find livestock that are small and relatively quiet. While chickens may not conform to certain noise ordinances in neighborhoods, rabbits and quail would be a wonderful alternative. To live in a self-reliant manner, you want to look at this project as a big cycle: You want to grow food to feed your animals, who in turn will provide eggs and/or meat for your family, as well as, manure for your garden. Many backyard homesteaders prefer growing their own feed so they know the animals are consuming high-quality nutrients and avoiding chemicals, pesticides, and antibiotics. Knowing some natural sources to feed your livestock will need to be researched, but can drastically cut down on the animal feed bill. If you plan on growing your livestock’s food sources, look at this article for more direction. As well, you’d be surprised that seeds like sunflowers are feed favorites for small livestock that chickens and goats. I had a lot of success with a small flock of chickens and three rabbits. I have had a few issues with predators, but once I understood how the predators got into the cage, the issue was resolved. I have an overflowing amount of organic manure composting in my yard and should be able to use it for my spring garden. As well, when spring time comes, the eggs will be overflowing and will be able to make some foods made with eggs. I even plan on expanding these homesteading products (at the hesitancy of my husband). I love that we have livestock and feel better knowing we have fresh food sources if the economy continues to decline. If you already have some livestock in your backyard, leave some helpful advice or tips you have learned along the way for the beginners! You left out bees! Much easier than quail or rabbits, and no poop to scoop. No doubt that the poop scooping is not always fun! I have a heap of manure composting now. To be honest, I did think about adding bees, but went ahead and just did the three above because I know how easy they were. Sadly, I don’t have a hive of my own yet, but it’s on my list of things to-do. 1) Order your supplies/hive components in late fall. This will allow you to assemble and paint etc. with plenty of time. 2) Plan on having at least two hives. That allows you to compare them and their progress, which will help ensure your success. 3) Order your bees in Dec/Jan, depending on your location. Don’t wait until spring when bee supply houses are crazy busy. 4) Watch videos on YouTube! You can’t watch too many, really. 5) Join a local beekeeping club, take a class, see if you can find a local mentor. They will be invaluable when you have questions and need to see things hands-on. 6) Having done both, I suggest buying a nuc. Packages are slightly cheaper, but nucs will put you farther ahead in less time, and are more than worth it. 7) Plan your apiary location based on local weather. You want some basics: facing east/southeast, easy to work around, raised to keep predators at bay (skunks and the like). Far better to get the location right the first time than have to move the bees. 8) Learn when your local nectar flow is. Ideally, get your bees well established before it is over, if you can. 9) Learn about what trees and plants provide nectar in your area. You’ll want to think about planting some (especially trees) if you can. Good luck to you! I have found this a wonderful project, and bees fascinate me. Started raising chickens for eggs almost two years ago. 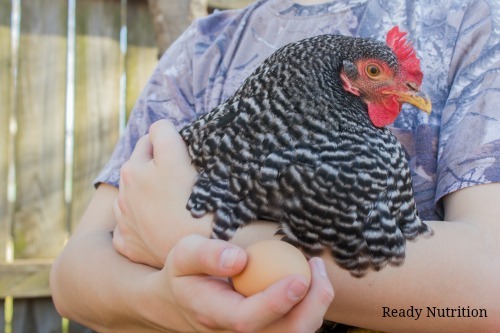 My best tip is buy mature birds who have just started laying. Chicks are way too much trouble and over half of mine which were guaranteed to be hens weren’t. I built my own A frame combination coop/run out of primarily junk lumber from a neighbors scrap heap. I also wrapped the chicken wire all the way around the bottom to avoid burrowing predators.